THICK nimbus clouds converging and hovering over Suicide cliff, and white birds seemingly distraught and fleeing the area were telling cleanup volunteers that an heavy downpour was on its way. And rain it did but the Japanese and other volunteers went on with their cleanup of the monument. After taking pictures and getting soaked, a good friend, Angelo Villagomez, took me to a place I had never visited or even knew existed. We negotiated the curves down from the Suicide Cliff, and went further downhill until we reached La Fiesta and then we turned left, went uphill and sped toward the direction of the tank. As we got closer, the tank appeared like a space ship looming large. Then we turned right and went farther uphill, driving along a paved road with thick grass encroaching on it. After 15 minutes of non-stop driving and mowing down the tall grass, we reached the place — Laderan Tangke. Chamorro for cliff, “ladera” offers visitors a breathtaking view of unspoiled nature. The 1.8-mile trail that can be finished in about two hours has posts to guide hikers through the loop. It can be a very exciting walk along the trail. It was just the two us, and the place felt a little eerie as silence overwhelmed us except for the occasional chirping of birds that was music to our ears. 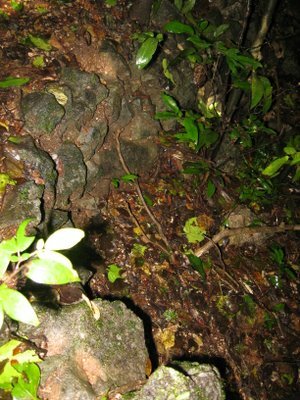 Exploring the entrance to the trail called Laderan Tangke, a coconut crab greeted us as it climbed a tree. 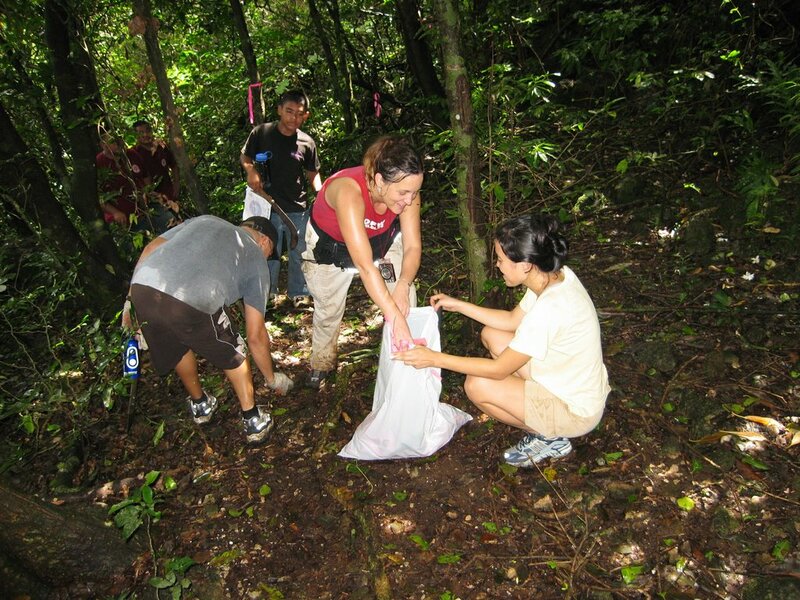 The coconut crab is just one of the many animal species that call the Laderan Tangke trail their habitat. After a few minutes, Division of Fish and Wildlife biologist Laura Williams arrived to keep us company as we checked out the trail. Before we proceeded to the trail, we — Angelo, Laura, and I — had a good conversation about the trail and the creatures that have come to call the trail their home. He also said that Laderan Tangke is a world-class nature trail where you can see birds and other wildlife that are found nowhere else in the world. A Marianas fruit dove or a reed warbler might seem like no big deal to some locals, but there is a segment of the tourist market that would pay big bucks to get a glimpse of rare birds. She said that the couple were able to see many native birds including the Micronesian Honeyeater (Egigi), the Golden White-eye (Canario), The Bridled white-eye (Nosa), the Collard Kingfisher (Sihek) and the Rufous fantail (Chichirika). “Unfortunately we were not able to see the rare and endangered Nightingale reed-warbler (Gaga Karisu), the Micronesian Megapode (sasangat), or the secretive Mariana fruit dove (Tottot), or the White throated ground dove (Paluman Kotbata). As we continued talking about the birds and the wildlife at the site, we took our first steps on the forest trail, passing by fresh green thickets. Negotiating the damp path, and trying to trace the markers left by Beautify CNMI!, we couldn’t help talking about the birds which chirp and flew over us. Laura said that many of the native Mariana birds are actually endemic to the Mariana Islands — endemic means that that they are found only in a specific area, in this case birds that are endemic to the Mariana Islands are found only in the Marianas. Some of the Mariana birds are only found on a few islands as well. Some of the endemic birds at the Laderan Tangke Trail include the Golden white-eye, the Bridled white eye, the Micronesian Megapode, the Mariana Swiftlet and the Nightingale reedwarbler. The Mariana fruit dove and the White throated ground dove can be heard along the trail, but they are rarely seen. 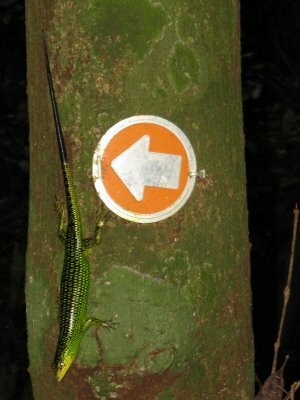 We had not gone deep into the trail when Angelo saw a dark-green lizard almost the same color as the trunk of the tree. When we got closer, it crawled up and evaded our attention. A few weeks back, the Beautify CNMI! 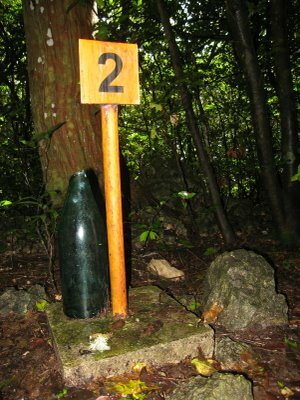 group, of which Angelo is an active official, did a cleanup of the place and left trail markers. As we went into the forest, Angelo and Laura tried to locate those markers — pink or yellow ribbons and green arrow signs on trees or orange posts set in the ground. According to Laura here are 16 specially marked areas along the trail. Laura and Angelo showed me the first mark where busy white-eyes frequently hop on tree branches and feed on insects. A little further down the trail, following the rocky, mossy part, we came upon one of the foxholes used by the Japanese soldiers during World War II. We paused for a few minutes and marveled at the greenery that surrounded us. There are pandanus and “kalaskas,” “umumu,” “gulos,” “paipai,” trees apart from the fern arch and other forrest flora that make this natural limestone area a habitat for many fauna collections. It was a nice trek although it was a little dangerous in places, and one should take safety precautions. Laura reminded me to wear sturdy shoes not sandals next time I do the trekking. With some sections covered with moss and the place as damp as it gets, the trail is slippery in places. Angelo said that with the trail markers and colored ribbons in place, it will now be a lot easier to follow the trail. As we headed back to the entrance of the trail, Laura and Angelo said that the experience was unique; however, they encourage people who follow the trail not to leave litter and keep the place clean. Angelo said, “Beautify CNMI is a coalition committed to make these islands a better place to live in and visit. We’re not just a ‘cleanup group,’ we also want to restore and then promote our natural and historical sites as tourist attractions. Laura said the guides are available at American Memorial Park and at the Division of Fish and Wildlife. As we all headed back to our respective appointments that afternoon, a lingering thought stayed with me as I drove away from the place — I will come back and finish the trail. And finish the trail I will.